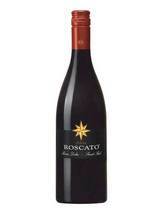 Roscato is an irresistible, delicately sweet, gently fizzy red wine from the northern Italian region of Lombardy. Made from three native grape varieties grown in this beautiful region for centuries Croatina, Teroldego and Lagrein Roscato makes a wonderful aperitif and is also incredibly food-friendly. Roscato seamlessly combines a long-held grape growing tradition with the flair of modern winemaking techniques and style. The result is a wine of enticing character that perfectly meets the surging demand for sweet red blends. With a low alcohol of 7% and just a touch of sparkle to flawlessly balance the sweetness, Roscato is the ideal complement for today's cuisine. Enjoy it with tomato-based sauces, classic Italian dishes, spicy foods and more. Color: Brilliant ruby red. Nose: Intense aromas of blackberries and ripe wild berries. Palate: Fresh, lively and frizzante with a soft lingering finish. Serving Suggestion: Refreshing and food-friendly; pairs well with flavorful dishes and spicy cuisine, or even your favorite dessert! Serve chilled.